Turret Kit - Fully modular and customizable AI turrets - New Features! [RELEASED] Turret Kit - Fully modular and customizable AI turrets - New Features! 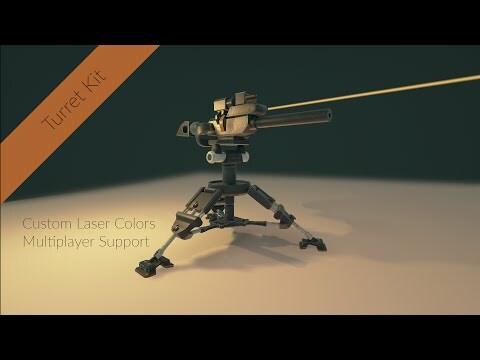 We're happy to announce our latest release: Turret Kit! The Turrets are fully dynamic and modular and contains 30+ variables for you to edit and alter to change the behavior of the turret. 2 Different turret meshes are included and easily changeable to your own. See the trailer and screens below! Last edited by Panda Studios; 06-15-2017, 06:57 AM. I'll be buying this as soon as I'm home XD any chance you'll be adding more components to the torrent like for rockets or a minigun? As for the minigum, this actually is in fact also supported, just not with the mesh but you can make it shoot really fast. Thanks Jago! And it's indeed not compatible with 4.10, our apologies for that! EDIT: Is now compatible with 4.9 and 4.10 too! Last edited by Panda Studios; 05-20-2016, 05:41 PM. Meshes might come, but not soon at all as those meshes are more scenario-based rather than the kit-based. As for 4.10, sadly Unreal Engine can't convert 4.11 files to 4.10. If there is enough requests we can consider re-coding in 4.10 to allow that version support. Good news! We've started downgrading this asset to support lower versions. Since downgrading involves re-coding it we cannot give an ETA as to when it would be done. We're working on it hard and will try to push it out as fast as we can. Good news! We've downgraded the project to also work on 4.9 and 4.10! Very good news ! it is updated in your website for 4.10 ? I like this very much so far. Only would be nice if the turret would calculate proper shoot angle when the bullet have gravity. Also the bullet dont play emitter if not hitting target type but thats easy to tweak myself. Maybe the shoot angle is easy to add too. Thanks for the bugreport for the emitter issue, We're fixing this now and going to push the update later. If you want to fix it yourself, in Bullet(BP) there's a Comment box "To All clients", the node in there also has to be connected to the previous false from "Does implement interface". Can you also elaborate a bit more on the shot angle as i'm unsure what you mean? Last edited by Panda Studios; 05-10-2016, 06:02 AM.